What is an Uplink Port in Computer Networking? In telecommunications, the term uplink refers to a wireless connection made from the ground to a communications satellite orbiting the Earth. The same term is sometimes used in computer networking and refers to a (wired or wireless) connection from a ​local area network (LAN) to a wide area network (WAN). A downlink is a connection made in the opposite direction of an uplink, either from a satellite to the ground or from an outside network into a local network. Internet downloads, for example, travel over a downlink to the downloading device while Internet uploads travel over uplink connections. Uplinks are commonly used in satellite telecommunications to broadcast satellite radio and television. Broadcasters transmit their signal feeds from ground stations to the orbiting satellite, a process known as satellite uplink. Cellular and other wireless broadband service providers also sometimes refer to the upstream communication path of their networks as uplink transmission. These uplinks may carry text messages, Internet file uploads and other data sent through the provider network. Some computer network hardware features uplink ports designed for plugging in network cables. These ports allow a network to communicate with other outside networks. Uplink ports on home routers, for example, allow connecting to broadband modems and the Internet. Ethernet hubs, switches,​ and routers traditionally designate one of their Ethernet ports as the uplink connection that is specially marked on the unit by name and/or color. Home broadband routers usually label this port "WAN" or "Internet" instead of "uplink," but the concept and function are the same. Connecting a broadband modem to a home router for Internet access. Connecting one uplink device (router, switch, hub) to another. Plug the uplink port of one switch, for example, into the standard port of another switch to expand the network's size. Note that, in modern computer networks, connections are bi-directional. Even for connections to an uplink port, the same cable or wireless link can transfer data both from and to devices on either end rather than only "up" or "down." The terms uplink and downlink here apply to which end of the connection initiates a data transfer. 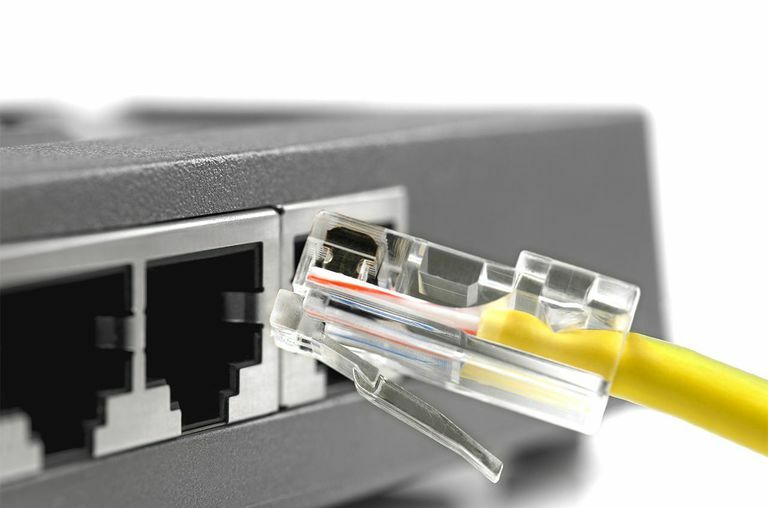 Networking professionals may point out that an Ethernet crossover cable can be used for connecting a computer to an uplink port or connecting two uplink ports to each other. While technically correct, the usefulness of these types of connections is limited. The traditional hardware logic of an uplink port supports only network uplink devices. However, many modern home broadband routers offer a dual-purpose port instead, one that can function either as an uplink or a standard port depending on the type of device connected to it. Before dual-purpose ports became popular, some older network equipment specially configured a standard port next to the uplink one and linked the two together as a pair. Specifically, the hardware logic of these products supported connections to either the uplink port, or the standard shared port, but not both. Connecting devices to both ports of a shared port device stops the unit from functioning properly.